On New Year's day, millions of women took to the streets in India to promote gender equality, linking arms to build a "Women's Wall." The Wall became the largest public gathering of women for gender equality in India. The government estimates between 3.5 and 5 million women participated, lining up on National Highway 66. 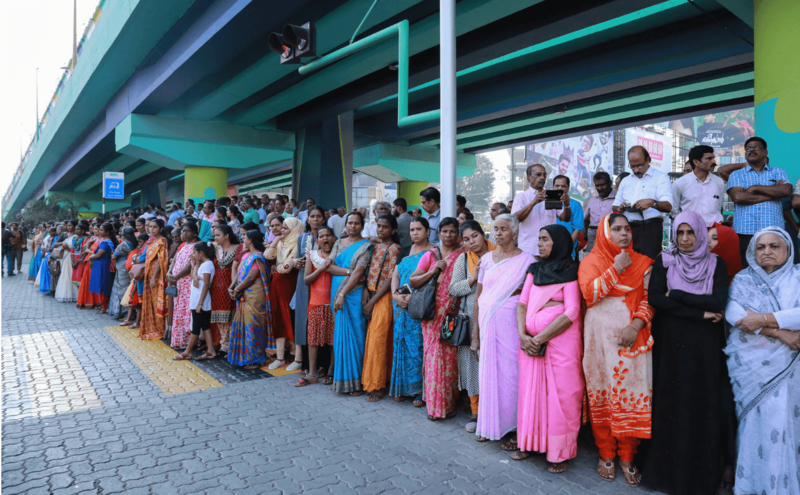 The show of support was particularly targeted against the ban that prohibited women of menstruating age to enter one of the country's most sacred Hindu temples. Various organizations and political parties funded the movement and provided transportation for millions of women. The result? A 385-mile wall. At 4 p.m., the women were asked to join hands and take a pledge for equality. They held the pose for 15 minutes. "I've heard so many older women say that they're impure when they're menstruating, and it's disturbing," says Rakhee Madhavan, a teacher and demonstrator. "I didn't want the impressionable young girls I teach to imbibe the same message. I wanted to be a part of this because I believe it's time for awareness and for change." The day after the "gender wall" demonstration, two women under the age of 50 finally visited the shrine. Under intense security and protection, these women were able to visit the shrine in the early hours of the morning. As a result, right wing violence ensued in protest of the women visiting the sacred temple. For many people like Madhavan, the violence was upsetting but did not stop their efforts or hurt their strength. "Social change doesn't happen in a day," she says. "It needs time. But with these small steps, we've made it easier for the next generation to embrace it. In this way, the wall of women marks a new dawn for feminism in India."